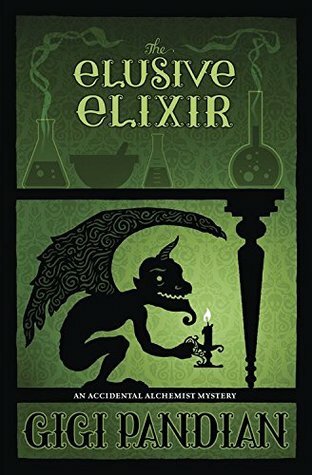 The Elusive Elixir is the third novel in the 'Accidental Alchemist' series. This sort-of-urban fantasy set in Portland, Oregon, is a pleasant romp. Using alchemy as the driver of its supernatural aspects is a different approach - even if, ultimately, it is used quite similarly to magic. In the first book, a living gargoyle, Dorian Robert-Houdin, turned up at her (newly acquired) door and turned her life upside down. Since then, she's discovered that a sinister group of alchemists have been using 'backwards alchemy' and a 'death rotation' to take alchemical shortcuts, which is Evil. Dorian, however, owes his life to it, and as backwards alchemy has started to crumble around the world, so Dorian, too, is rapidly losing life force. The Elusive Elixir is therefore a book about Zoe's continuing quest to save her friend. The first two books were primarily (murder) mystery novels. The Elusive Elixir, too, is bound to please fans of Jessica Fletcher / Murder, She Wrote, but the urgency of Dorian's deterioration is more in the foreground than before. The Accidental Alchemist series is pleasantly entertaining fun. Murder, mystery, magic (well, alchemy) and an incorrigible living gargoyle and an equally incorrigible teenager provide plenty of diversion. Meanwhile, as Dorian is a chef by training and Zoe is a vegan, the series is unique in its focus on vegan food, which features heavily. The foody descriptions throughout are plentiful, and each volume includes a bunch of vegan recipes at the end. The one thing that Gigi Pandian has not quite mastered yet (in my opinion) is the art of exposition. There's quite a lot of it in each novel, mostly delivered by Zoe reminiscing. If you have not read the first book in the series, rest assured, all its plot points are delivered in each subsequent volume by means of slightly clunky exposition To make matters worse, there is an awful lot of repetition. If I didn't know any better, I would think Gigi Pandian is a fairly elderly writer, as it does have a bit of a nattering habit of self-repetition. (She's not elderly, at least not according to the 'About the Author' text in the back). Perhaps the Accidental Alchemist series is aimed at an older reader demographic (like the Brenda & Effie Mysteries series) - for me, it was a bit annoying. If you like light entertainment murder mysteries, (urban) fantasy and a dash of vegan cuisine, and if you can forgive a little clunky repetition, you'll enjoy this book (and its predecessors) very much. Hmm, this sounds like fun. I should look for the first book. I feel the need for some light entertainment, lately!